Left multiple female sponge eualids on a cloud sponge. Right: close-up of the same image. 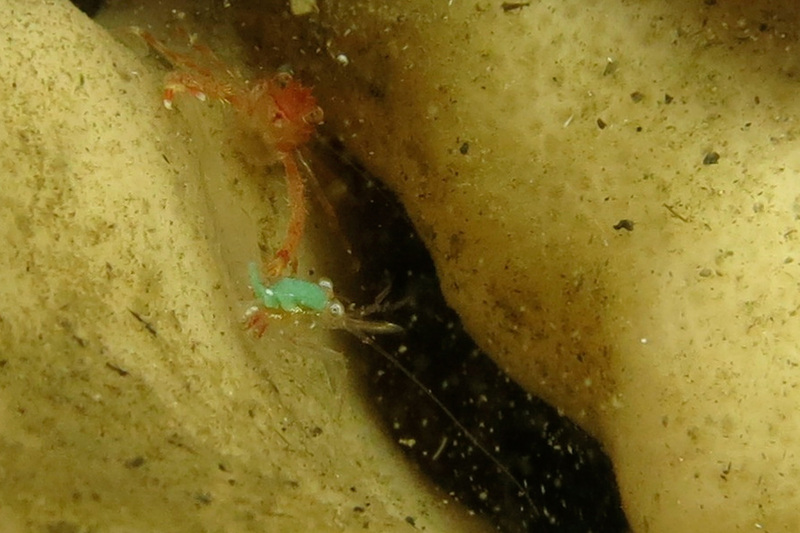 Note the conspicuous bright turquoise ovary and eggs. Photo by Jenn Burt. The sponge eualid is a small shrimp, with the carapace of both males and females reaching a maximum length of around 5.5 cm in length. It is usually pale yellow and translucent, though larger individuals may bear indistinct reddish markings. The female's ovary and eggs, which occupy a large portion of her body, are bright turquoise. The male's third maxillipeds, used for sparring with other males, are conspicuously long: they can be nearly twice the length of the carapace. Readers with online university library access may be able to view Lamb and Hanby's excellent photos of a both the male and female via the KnowBC online encyclopedia. Further identification details can be found in the original species description by Jensen (2004). 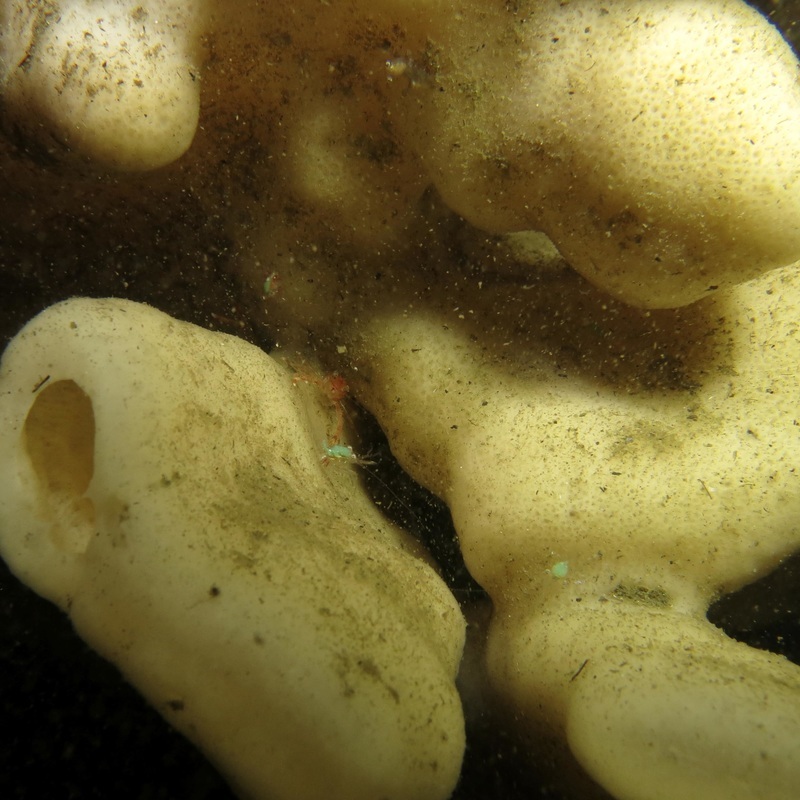 The sponge eualid is found sheltering in the cloud sponge (Aprhocallistes vastus) and the boot sponge (Rhabdocalyptus dawsoni). It has been recorded in the subtidal at 18-241 m deep, from Adak in the Aleutian Islands, Alaska to Hood Canal in Puget Sound, Washington. The sponge eualid was only recently described; it was previously confused with the doll sponge (Eualus pusiolus), a similar species but differentiated by the male's smaller third maxillipeds (less than the length of the carapace) and the female's apparent lack of turquoise eggs and ovary, though this last point is not confirmed as a distinguishing characteristic of the sponge eualid. The sponge eualid is also slenderer than the doll eualid. Another similar species is E. subtilis, which has a size discrepancy between males and females. More detailed differentiating characteristics are described in Jensen (2004). Jensen, G. (2004). Status of Ealus pusiolus in the northeastern Pacific, with a description of a new species of Eualus (Decapoda: Hippolytidae). Journal of Crustacean Biology. 24(3): 463-469.